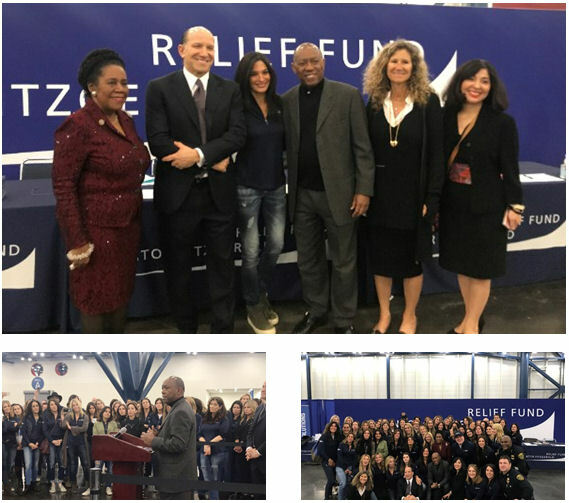 February 14, 2018 -- Mayor Turner on Wednesday publicly thanked the Cantor Fitzgerald Relief Fund, Cantor Fitzgerald President and CEO Howard Lutnick, and Allison Lutnick, for their generous support of families who were displaced by Hurricane Harvey. This week the Lutnicks, along with approximately 200 volunteers, representatives from Cantor Fitzgerald, BGC Partners, and their affiliates traveled to Houston to distribute $5 million in gift cards to families with children enrolled in local school districts and charter schools. The children were selected by the schools and are from families whose homes and lives were devastated by historic flooding and other storm-related issues. The Cantor Fitzgerald Relief Fund sought to assist school districts and charters that served a majority of economically disadvantaged students. The gift cards were distributed to families on February 11 & 12, 2018 during an event at the George R. Brown Convention Center. On Sunday, Mayor Turner spoke to volunteers about the city’s ongoing recovery and resiliency in Harvey’s aftermath. For more on the mayor’s remarks: https://www.youtube.com/watch?v=-PFWxb2huRY&feature=youtu.be. City of Houston Director of Education, Juliet Stipeche helped facilitate the gift card distribution that included several local school districts, local charter schools, and other local educational institutions. “We have a long way to go to make everyone whole again and to rebuild our wonderful city, but I want to thank the Cantor Fitzgerald Relief Fund and everyone else who had a hand in this amazing event,” Stipeche said. The children and the families who received financial assistance represented the Aldine ISD, Alief ISD, Spring ISD, Sheldon ISD, Pasadena ISD, KIPP/FE, Galena Park ISD, CyFair ISD, Spring Branch ISD, Baker Ripley, Houston ISD, Houston Housing, Homeless Coalition, Patterson Elementary, Raul Yzaguirre Charter and Young Learners Charter. The Cantor Fitzgerald Relief Fund was founded by Howard and Edie Lutnick in the wake of 9/11 to provide direct, immediate financial assistance to those in crisis. To learn more about the relief fund, please visit https://www.cantorrelief.org/.